Daffodils, daylight savings time, green beer, Lent, basketball: March has arrived. I typically forget to wear green on St. Patrick’s Day, have never filled out a March Madness bracket, and miss that hour of daylight in the morning. However, the extra hour of daylight in the evenings, the sight of the first green blades of grass and an Iowa State trip to the Big Dance are worth celebrating. 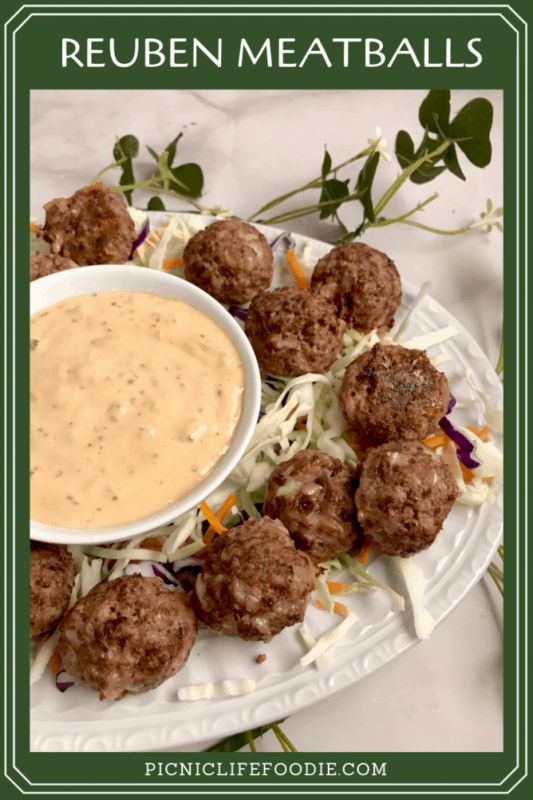 What better way to celebrate than with a seasonal meal: Reuben Meatballs with Thousand Island Coleslaw! I love Reuben sandwiches all year-long, but seem to crave them more in March when Corned Beef and Cabbage is so popular. 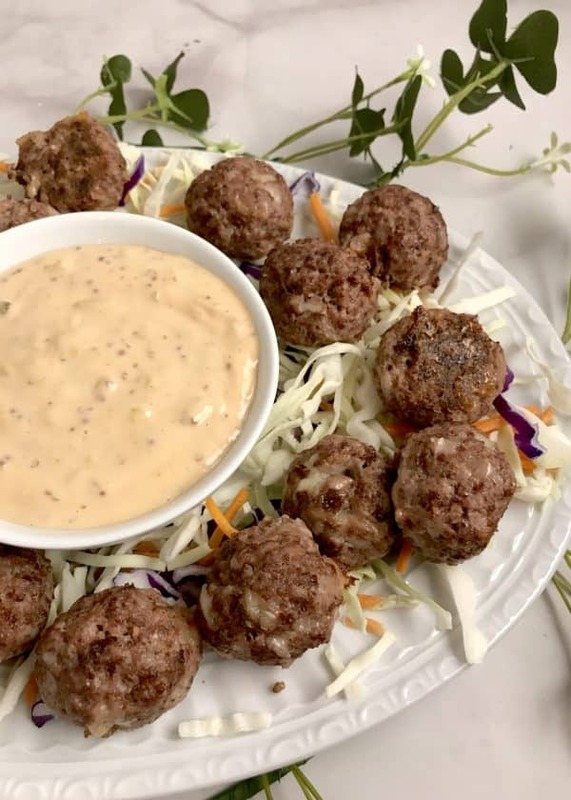 When thinking about creating a meatball from this amazing sandwich, there were the obvious ingredients to consider: corned beef, sauerkraut, Swiss cheese, rye bread, and Thousand Island dressing. The difficult part would be recreating that distinct flavor balance throughout each meatball. The biggest challenge for this recipe was the main ingredient. I wanted to use ground beef as it is convenient and accessible. I have had mixed experiences buying corned beef in the deli counter: sometimes it’s great and sometimes it isn’t. Starting with a beef roast and allowing it to cure for 10 days was obviously much too complicated a process for making meatballs. After researching the spices and herbs used to create the brine for corned beef, a rather unusual combination resulted and, more importantly, worked! You can see the list of ingredients for the seasoning in the recipe below. Do not allow the number of ingredients to discourage you from making this recipe. They are likely already in your cupboard and take little time to measure and combine. The cabbage that typically accompanies corned beef is incorporated two ways in this recipe: as sauerkraut inside, and in the coleslaw beside, the meatball. Replacing the milk that is typically added to a meatball mixture with finely chopped sauerkraut and some of the sauerkraut liquid ensures that element of the Reuben will not be lost. And who can resist that layer of tangy dressing? 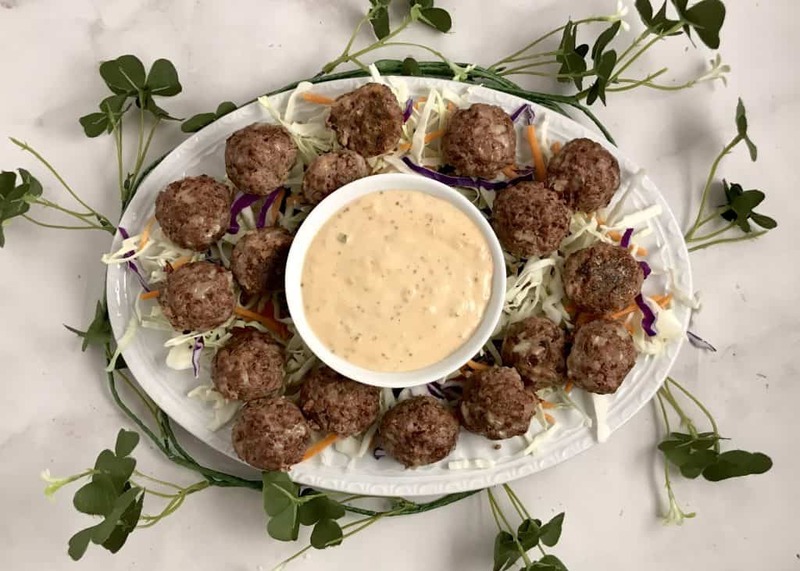 Using it to create a side of Thousand Island Coleslaw and as a dipping sauce for the meatballs carries the flavor into every bite. A Reuben just wouldn’t be a Reuben without rye bread. Making homemade bread crumbs is super easy and immediately adds more flavor to the meatballs. A blender is the perfect tool for making flaky breadcrumbs. My food processor tends to grind the bread up, making the crumbs dense. If the bread crumbs are dense, the meatballs will be too. The trial run of this recipe turned out well but was definitely lacking something. My family agreed that they tasted good but did not taste like a Reuben. 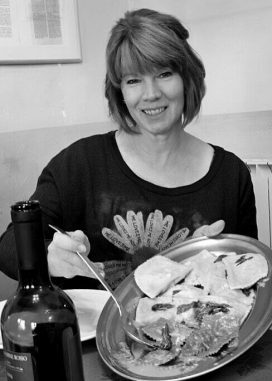 Adjusting the ingredient proportions and adding toasted caraway seeds was all it took to make the difference. Toasting and crushing the seeds is important; it brings out the oils in the seeds which wakes up the flavors. 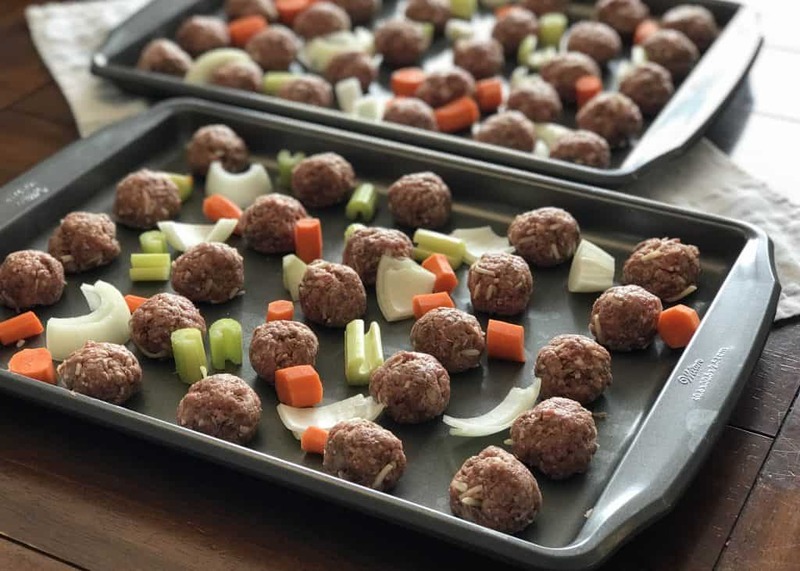 The final enhancement comes from baking the meatballs alongside some carrots, celery and onions. When a beef roast is curing, these vegetables are added to the brine to give more flavor to the meat. Placing them on the pan with the meatballs will deliver a similar subtle flavor. I am very happy with the results of this recipe. There were enough meatballs leftover so we now have a bag in the freezer to enjoy another day. sauerkraut will keep the meatballs from drying out. 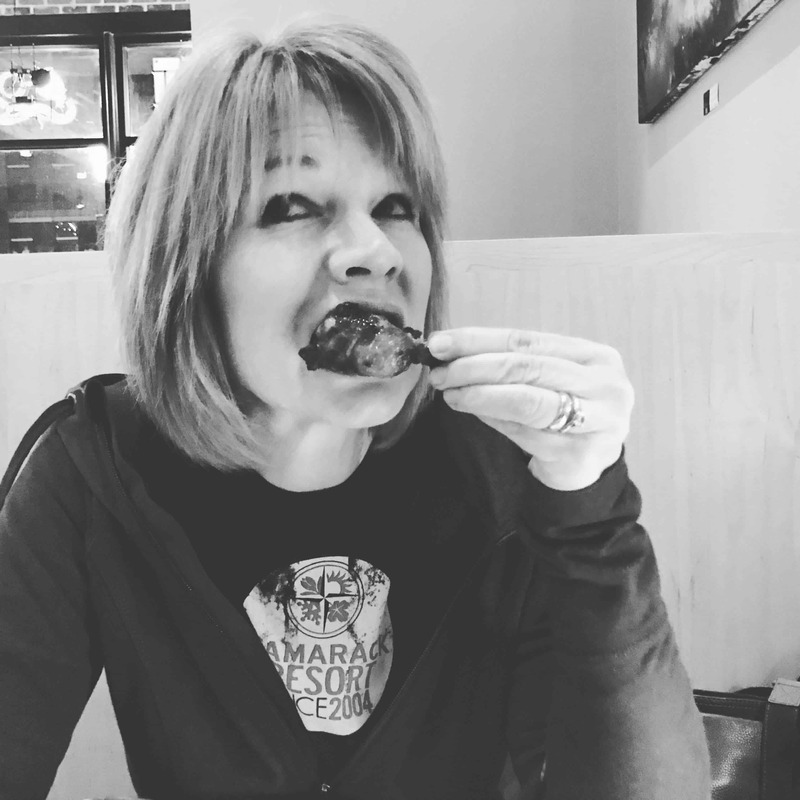 Deconstruct that Reuben sandwich and you've got a bite-sized meatball! Ground beef, sauerkraut, Swiss cheese, rye bread crumbs create an awesome replica in this recipe! Toast caraway seeds in a dry pan over low heat, stirring frequently, for 2-3 minutes or until fragrant. Remove from pan and into a small bowl. Add black pepper, salt, cinnamon, allspice, clove and ginger. Place in a small food processor or coffee grinder and pulse until caraway seeds have been crushed. Mixture could also be placed in a resealable plastic bag, folded into a towel and crushed with light pressure from a rolling pin. Add 2 cups of sauerkraut, removing as much liquid as possible, in the bowl of a food processor and pulse until finely chopped. Tear half of the the rye bread slices into smaller pieces and place in a blender. Pulse until fine crumbs form. Measure resulting crumbs and repeat with more bread to make 3 cups. In a large bowl, combine ground beef, 1 1/2 cups of the chopped sauerkraut, spice mixture, eggs, mustard, 2 cups of the bread crumbs and cheese. Form into 1 1/2 inch meatballs. If the mixture is too soggy, add more breadcrumbs (1/2 cup at a time). If the mixture is too dry, add liquid from sauerkraut (1/4 cup at a time). Make adjustments until meatballs will hold together. Place in a roasting pan or two sheet pans that have been coated with cooking spray or lined with aluminum foil. Leave room between the meatballs to allow browning and even baking. Toss carrots, onions and celery in between the meatballs. Bake for 10 minutes. Reduce heat to 350 degrees and bake for an additional 10 minutes. Larger meatballs may require more baking time. Serve hot with Thousand Island Coleslaw. Combine all ingredients except cabbage mix in a bowl and stir to combine. In a large bowl, combine coleslaw mix and half of the dressing. Fold together gently just until cabbage is lightly coated with dressing. Allow to rest for 10 minutes. The salt will draw out the water from the cabbage, adding moisture to the slaw. More dressing can be added according to personal preference. 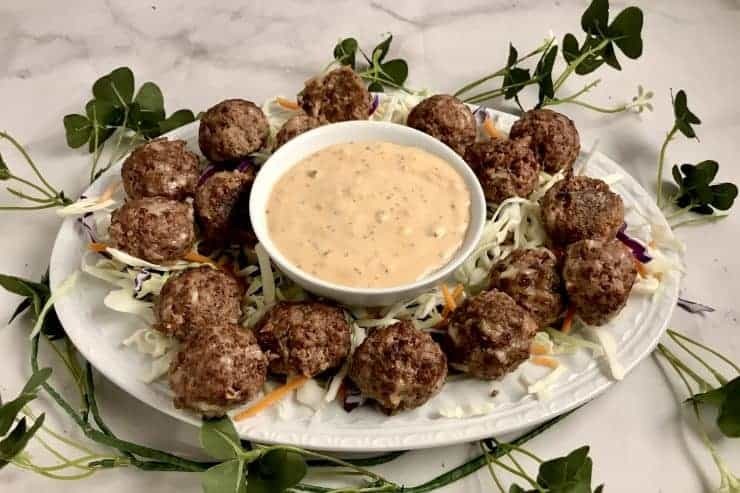 Serve remaining dressing as a dip for the meatballs. Toasting Caraway Seeds: Pour seeds into a dry, non-stick pan over low heat, stirring frequently. Allow seeds to warm 1-2 minutes, or until fragrant. Remove from heat and from pan and allow to cool. Pickle Relish: If using dill relish instead of sweet, add one teaspoon of sugar to the dressing.